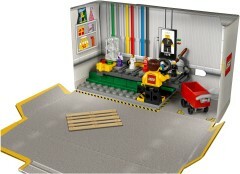 Images of the next gift-with-purchase at shop.LEGO.com, 5005358 Minifigure Factory, have been uploaded to LEGO's server in preparation for the start of the offer on Sunday. The 86-piece set, released as part of the minifigure's 40th anniversary celebrations, will be free with purchases over $75 from 1st April until the 15th in the USA and Canada, and in Europe it's available a day later, from the 2nd April to the 22nd, with purchases over £55/€60. 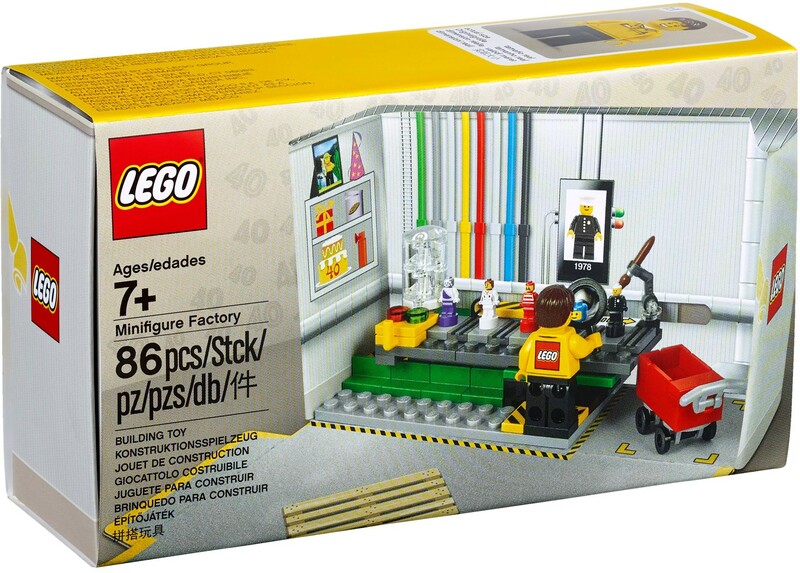 It features a model of a minifigure production line, complete with five micro figures decorated to represent classic minifigs released over the last 40 years. The box folds out to form a backdrop which makes it look more substantial than it actually is. View pictures after the break. Which figure is the purple one? I am pleasantly surprised that it is only £55 for us Brit-Bricks, seeing as I was half expecting to purchase up to £65 or £70 worth of LEGO to have this Minifigure Factory set! Just got to think of what else to buy - and compliment - with the new TRON Legacy Ideas set. That minifigure looks like he’s got a massive Lego tattoo on his back...! Nice figs, but that paper is borderline insulting. Come on, Lego, how about some nice old-fashioned plastic, it's not that expensive, you know? Normally with each microfig you get an additional one spare. I hope that's still the case with this set and that we get two each of these guys. One of the simplest yet coolest freebies they've come up with. I didn't think I'd bother with this after the similarly-boxed Nexo Knights one, but the microfigs and the Minifig are excellent. Exactly the sort of things that most kids and collectors love. @brainslugged: I highly doubt they will inlcude two of each microfigure. I second aleydita: This is the perfect collectors item - simple, yet very cool! @Holodoc - It looks like you're right. Even though Ninjago City came with seven spare microfigs, according to Bricklink, the Helicarrier didn't have any spare printed ones. Anyone know what color the paintbrush is? The fig's head is blocking it and now that the Easter set has introduced a second color I don't just assume it's green anymore. I'll need this to complement the 60 Years set. Anyone know the availability here in Australia? Sunday's my birthday so I'm definitely going to have the funds to make a sufficient [email protected] purchase. Also, that link is broken. Who is the 5th Microfig with the white jacket? a Nurse? ^Yes, looks like the nurse from the first series of Lego Minifigures. Damn, this blue astronaut will be extremely popular with classic space AFOLs. Great for microscale MOCs. The Figs only need hats in my opinion. I have been experiencing the same problem with the Shop At Home link. Thought it was just my computer acting up. Really nice nanofigs, but why has the pirate red arms? The Ninjago fig has a different colour on the arms vs the legs so that's obviously possible. Stickers were bad enough....now cardboard box displays too? That's like goodie bag stuff from a Children's magazine. Should be free with £20 spend - In my opinion of course! Still, it’s a free gift, so no complaints here! There are things you encounter in life that upon realizing their existance you suddenly need. In the case of this set it is the Freddie Mercury nanofigure :) Excellent little set overall and well done at inducing another LEGO budget argument with my wife. I’m surprisingly not interested in this. I like some of the nanofigs but I don’t think I’m $75 interested. I may make an order, but I’m equally content not making one. Classic space is the only one worthwhile to me. If it were Captain Redbeard maybe. If there was a castle, definitely. But pixal and the nurse are meaningless to me. Either way. Have fun with it for the people that do get it. I agree they are not "microfigs." Actually, BL lists them as "statuette" or as "trophy." I collect both the microfigs and statuettes/trophies, so I guess I need to come up with something to purchase in order to pick this set up. @BrickDangerous: I wouldn't say the cardboard backdrop is insulting, considering this is a free gift-with-purchase set and still has quite a lot of bricks compared to other gifts with purchase like the Iconic Cave Set. If the back wall were built from bricks then it would have almost certainly driven up the cost, not to mention might've required more prints or stickers to create details like the Classic Spaceman on the display screen on the wall! Plus, even if you take away the cardboard backdrop entirely, it's still a really nice model. *Kai, Zane, Cole, Jay, and Wu have already been depicted as microfigures, albeit a different type of microfigure, in the LEGO Games sets. *Female characters were few and far between in many of the classic themes, so choosing a female character to represent Ninjago helps balance the genders in this set a little bit better. *Pixal's main outfit color being purple helps her stand out from the other four figures better than a lot of the classic Ninjago cast (though I guess Lloyd could've worked for this as well). *The main ninja characters have appeared many times over the years, whereas Pixal hasn't despite her importance. So the designers might've been eager to introduce a new version of her. *Like the other figures in this set, Pixal's outfit is instantly recognizable even when the level of detail is so greatly reduced. A lot of the other Ninjago characters could more easily be confused for ninja characters from other themes at this scale. Note that even when we only had tiny, blurry pics of this set, Pixal was practically the easiest figure to identify! *The designers may have wanted to spread out the release dates represented by these figures (i.e. 1978, 1984, 1989, 2010, 2014). If they'd included a figure from the first collectible minifigures series in 2010 AND a figure from Ninjago 2011 or 2012 those dates wouldn't have been spread out as much. Anyway, what a delightful set! ^_^ I look forward to getting it! Is the brush just brown? It looks like the color should be visible there if there’s any color. My issue is, is this only SaH? I was planning to pick up a few Go Brick Me sets at my Lego store on Monday... I’m not opposed to buying online but I don’t know if I’d get them fast enough. @Brainslugged- the Helicarrier didn't come with any extra nanofigures, but an extra Ant-Man and astronaut were included in the Superhero Airport Battle and Saturn V, respectively. The unprinted ones usually have extras as well (to the best of my knowledge). I have a pretty big order and while I though of adding Darth Vader pod to my collection I am actually considering against it as the time is so much later and I want this more than Vader (sorry my lord). I really wish they had left out this stupid pixel figure whoever she is. I thought she was one of those stupid purple rock monsters from Nexo Knights. Why couldn't they have done a classic castle queen if they had to balance the genders? That would have covered Castle as well. Not convinced this is genuine, something is off with cockpit too many stickers, droid head not printed, and box is just a little bit too plain and the top right crease is just too “convincing”. After the masterful snowspeeder upgrade last year this is actually a step back, if this is shown to be authentic I won’t be purchasing and have hoped for a remake for a long time. ^ Wrong thread, perhaps? Thinking of the Y-wing Starfighter? From the image you put up a few weeks ago I though that was P.I.X.A.L, glad to know it is! Beyond that we've got the OG Police Officer, a Classic Spaceman, a Classic Pirate, and a Nurse who might be the CMF. Interesting. @Brickchap: I figure they probably wanted somebody in there to represent Ninjago, seeing as it's one of their biggest and most important themes these days. Also, a Classic Castle queen wouldn't have been all that recognizable without the tall hat, seeing as that was basically her most distinctive attribute.